My first visit to Georgia in 2010, included a road trip to the Upper Caucasus Mountains known as the Svaneti region and included a stop in the village of Ushguli. 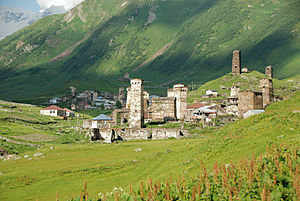 Ushguli is a UNESCO World Heritage Site and is referred to as the most elevated settlement in Europe. Ushguli sits at the foot of Georgia’s highest peak Shkhara (5068M). Two memorable experiences in this life changing trip to Georgia was the traditional polyphonic music and the variety of Georgian dishes. First the food in Svaneti. 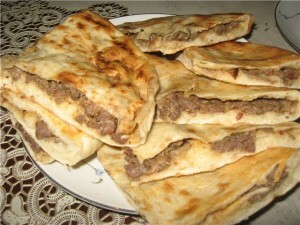 Kubdari is the national dish of the Svan people in Georgia. It is oven bread filled with local spices and meat – usually veal The bread is leavened and allowed to rise and the meat is from the local village. Have plenty of napkins close by because the tasty juices from kubdari run down your hands. It’s perfectly acceptable to enjoy this dish with your hands and when no one is looking, I found myself licking my fingers – also acceptable! When I find myself longing for Georgia, I sit back and listen to my CD of select songs and immerse myself in this ancient polyphonic singing. The only thing that’s missing in my virtual experience is the smell of kubdari. Tasty traditional dishes, ancient polyphonic music and the breathtaking mountains of Svaneti make for life long memories and can only be experienced in Georgia.